The global burden of disease assessments, listed outdoor air pollution among the top 10 health risks in India. The study estimated 695,000 premature deaths and loss of 18.2 million healthy life years due to outdoor PM2.5 and ozone pollution for year 2010-11. Among the health risk factors studied, outdoor air pollution was ranked 5th in mortality and 7th in overall health burden in India. Household (indoor) air pollution from burning of solid fuels was responsible for an additional one million premature deaths. The issue of household energy consumption (HEC) and its contribution to indoor and outdoor air pollution is critical to India, because of the high magnitude of population exposed to such pollution every day. With that in mind, the HEC was studied in detail, to estimate its contribution to the ambient air pollution via source modeling approach – emissions and dispersion modeling. The HEC emissions are broken down into four categories (a) cooking (b) lighting (c) space heating and (d) water heating. The emission factors for the fuel categories are obtained from studies collated by the Indian Institute of Technology Bombay, Mumbai. No new lab tests for the emission factors or surveys to ascertain the HEC patterns were conducted. A summary report for each of the 640 districts can be viewed below (and download the same as a pdf document by clicking it). 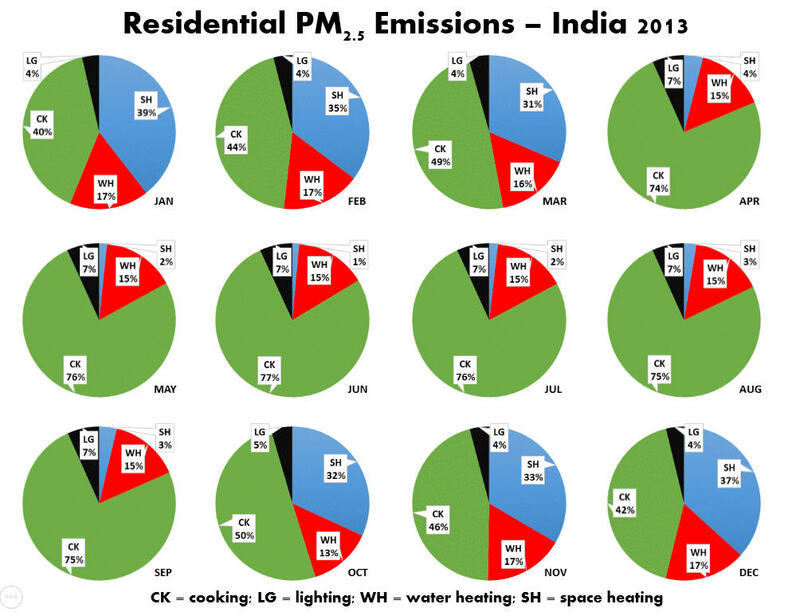 The summary sheet includes information from census-India on share of cooking fuels in use, total emissions from cooking and heating, share of the emissions in comparison with national shares, percent contribution of HEC to the ambient PM2.5 pollution (based on WRF-CAMx modeling with all emissions), and health impacts that can be linked to HEC in each district. The cooking and lighting emissions are considered constant, on a daily basis, through the year. 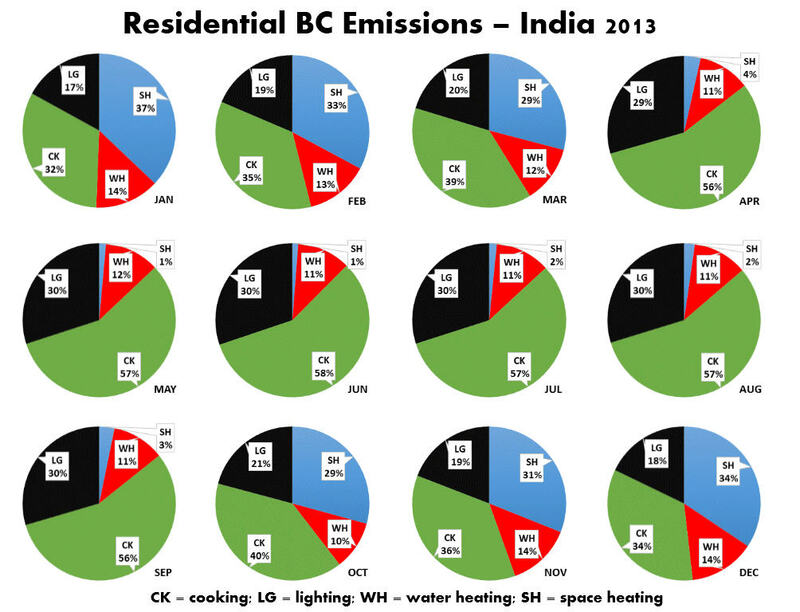 The water heating and space heating emissions vary by month. A report is underway, with interesting features observed during the emissions and pollution calculations. We would like to acknowledge the support of Global Alliance for Clean Cookstoves (Washington DC, USA) and the guidance of Dr. Chandra Venkatraman and her team @ the Indian Institute of Technology (Mumbai, India) in establishing this new dynamic emissions methodology for India’s household energy sector. The emissions inventory is in use on everyday forecasting of air pollution for the 640 districts in India.